Love sleek lines, clean design, and cutting-edge amenities? Then a modern wedding venue is for you! Contemporary wedding venues are perfect for standing apart from the droves of more traditional (and some may argue forgettable) settings for the big day. Be sure to take a peek at some of our favorite modern wedding venues from around the country (and beyond). Tucked away along the edge of the Carmel River, Gardener Ranch offers the rustic beauty of a ranch with a modern spin. A timeless backdrop of greenery as you say your “I do’s” on one of the Ranch’s four scenic ceremony lawns, each with an individual character that can be tailored to suit your ideal wedding day. Whether you exchange your vows beneath a thick canopy of majestic oak trees or share your first kiss as spouses at the riverside, you are sure to walk away with beautiful wedding photos and even more beautiful memories! The spaces available for your reception are equally picturesque. 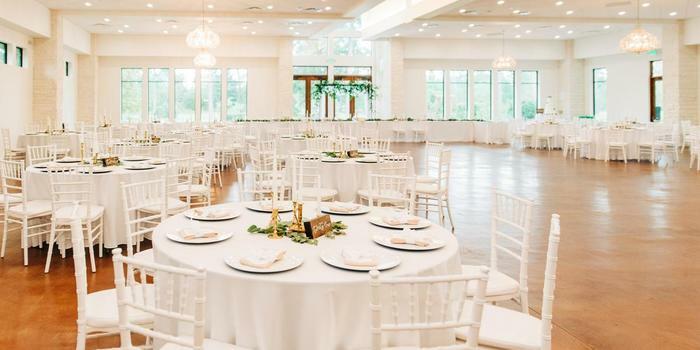 You can dance the night away beneath the whimsical twinkle of patio lights on one of the lush lawns or enjoy an indoor celebration under the pale wood vaulted ceilings of one of the private clubhouse banquet rooms. Additionally, you and your guests can enjoy a wide variety of activities that go beyond the typical “cake and dancing” that characterize traditional weddings. Imagine watching your guests as they joyfully pass the time by playing a game of croquet, tossing a few horse shoes, and trying their hand at bocce ball. Close off the night with a gathering around the fire pit, punctuating your perfect day with an intimate experience that bonds your friends and loved ones forever. Always dreamed of a beach wedding, but want all of the stylish modern amenities of a first-class hotel venue? Then look no further than the Hard Rock Hotel in Cancun! Nestled against the bright blue waters of the Caribbean, this marvelous location offers a show stopping backdrop for any wedding day. Imagine tying the knot on a white-sand beach, the cool tropical breeze shifting your veil in the wind as your look upon your beloved the moment before you share your first kiss as spouses. You select any ceremony style you choose -- ranging from a stunning driftwood archway to a glamorous white iron structure dripping in jewels that glitter in the sun. The sound of booming fireworks will accompany as the sounds of applause from your guests as you leave your ceremony hand-in-hand. Revel in a glass of complimentary sparkling wine and enjoy celebrating your union with your nearest and dearest in one of the hotel’s lavish gathering spaces, complete with sleek finishes and decorated with memorabilia that will make any music lover sing their praises! Combining a knockout setting and easily customizable all-inclusive packages, the Hard Rock Hotel Cancun offers couples the destination wedding experience that they have always envisioned. Despite its centralized location only an hour outside of downtown Houston, 15 Acres offers soon-to-be-wed couples with a picturesque retreat in the heart of natural splendor. This scenic venue perfectly marries down home country charm with a sense of elegance that is distinctly modern. Prepare for your shining moment by relaxing in one of the pre-wedding spaces, including a relaxing bridal suite and retreat-like groom’s cabin. Envision walking down the gray stone aisle that is reminiscent of a garden path to meet your future spouse beneath a rustic wooden archway draped in flowers. The property’s many majestic trees and sparkling pond will serve as a timeless backdrop for your “I do’s.” Dance the night away with your beloved in the elegant ballroom, an expansive space complete boasting sky-high 24-foot ceilings, floor-to-ceiling windows overlooking the property, sparkling chandeliers, and stylish yet neutral finishes that can be adapted to suit any wedding theme or sense of taste. You can enjoy this luxurious space with up to 400 guests. Entirely family owned and operated, 15 Acres can provide you and your beloved the personalized, wholesome touch that you have been searching for in a modern wedding venue! The modern philosophy of taking something old and transforming it into something new is taken to heart at SKYLIGHT. This unique industrial-chic wedding venue is nestled in the heart of Denver, offering a distinctly cosmopolitan feel without abandoning the rough charm of this studio-like space. The venue’s open-floor concept allows you to build the big day that you have always imagined, utilizing the raw elements of the space as a blank canvas on which to paint your dreams. White brick walls pair beautifully with the expansive skylights and show stopping floor-to-ceiling windows that welcome the natural light inside. These features create a wonderfully illuminated space that doesn’t abandon the darker side of industrial chic, including polished concrete floors and exposed wooden beams dotted with twinkling lights. Stellar city skyline views add the perfect modern edge and create an additional point of interest in this already singular space. Aside from the space, you receive unrivaled flexibility when you book SKYLIGHT -- thanks to its open vendor policies and 24-hour rental period that allows you to celebrate this magical moment all night long. When you host your wedding day at SKYLIGHT, you can rest assured that you have complete creative control over your celebration. Combining the singular beauty of the desert with sleek, modern architecture, this vibrant venue is sure to turn heads! Nestled in Paradise Valley, Mountain Shadows manages to provide the kind of wedding day experience that sticks with you. Tie the knot on the lush green lawn as you and your guests drink in perfect views of the surround Camelback and Mummy Mountains, creating a one-of-a-kind atmosphere for your ceremony. Dine on delectable cuisine in one of Mountain Shadow’s stunning ballroom spaces, all of which channel the 1950’s modernist feel that defines this resort. Open up the ballroom’s glass walls out to the expansive outdoor terrace where you can enjoy an unparalleled view of the sunset as it casts a rainbow of colors of the surrounding desert flora. If you’re having a more intimate celebration, host a quiet affair in the private living room space. On-site spa amenities allow you to unwind before walking the aisle, while private poolside cabanas allow you to celebrate with friends and family long after the big day is over. Blending luxurious beauty with a serene sense of comfort, Mountain Shadows provides couples with a truly unique wedding day experience that is sure to delight family and friends alike. 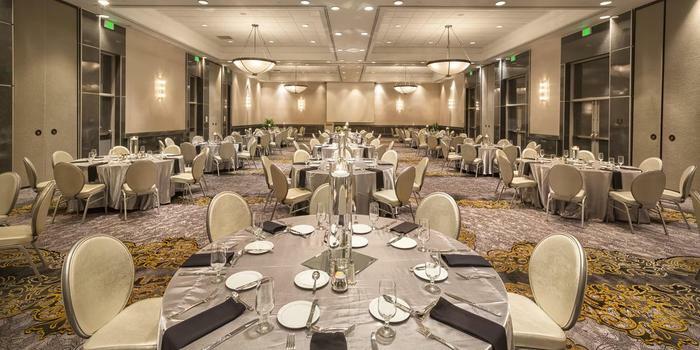 An unparalleled sense of glamour and elegance will define your wedding day experience at the Crowne Plaza Orlando Universal. Tie the knot in the serene courtyard space just steps outside of the hotel, sharing your first kiss as spouses surrounded by stately columns dripping in breezy white fabric and blooming flowers. The white pillars and chairs contrasts wonderfully with the lush green grass and towering palms, creating an idyllic backdrop for unforgettable wedding photos! Kick off the festivities with cocktail hour in the Grand Atrium, where you and your guests can toast to a life of wedded bliss beneath the shadow of a sweeping staircase as a butler passes around finely crafted hors d'oeuvres. Continue the celebrations in the lavish Crowne Ballroom, an exceptionally refined space distinguished by its expansive windows, modern-style chandeliers, and expansive dance floor that beckons guests to have the time of their lives. The neutral color scheme of each indoor space is adaptable, allowing you to customize your big day to suit your preferences. To supplement these gorgeous spaces, this hotel offers expert service to deliver a first-class wedding day experience that you and your beloved can enjoy stress-free. Few places wed modernity and the sophistication of the past more seamlessly than New York City! The Dominick carries on this tradition beautifully by offering a lower Manhattan wedding venue that is sure to please even the most discerning of couples. There is everything to love about this venue -- from the interiors to the jaw-dropping views. The Dominick offers a number of singular spaces for hosting your ceremony or reception. The SoHo Ballroom offers a spectacularly large space brimming with modern sophistication, complete with beveled ceilings dripping in crystals and floor-to-ceiling windows that look out on the sparkling Manhattan skyline. The Hudson Square Ballroom, with its soaring ceilings and private outdoor terrace, is ideal for a more intimate affair overlooking its namesake. 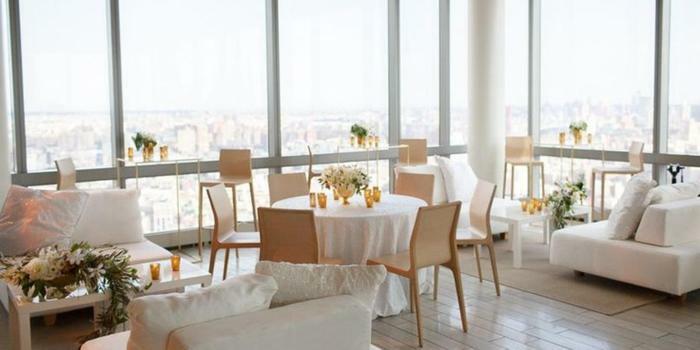 To take full advantage of the truly one-of-a-kind venues surrounding the building, look no further than the SoHi -- a stunning dinner space that towers 46 stories above Lower Manhattan and is completely enclosed in glass for panoramic views. Customizable wedding packages are also available, making tailoring your wedding to you virtually effortless. Pair sophisticated settings with unrivaled vistas of the city skyline and the Hudson River when you host your big day at The Dominick! Combining dazzling modern architecture with a vibrant atmosphere unique to Roanoke, the Taubman Museum of Art offers a wedding venue for couples who think differently. Boasting beautiful views of the nearby Blue Ridge Mountains and flexible spaces that can be customized to suit your tastes, this venue is perfect for those with vision. Imagine saying “I do” in the sleek and modern Auditorium complete with a stage, or the Taubman Theater, an intimate space that can be customized to suit your every need. You can even exchange vows within the intimate gallery against a light-filled window. The jaw dropping Atrium is the picture-perfect setting for any large celebration, allowing you to make your grand arrival by walking down a lighted glass staircase and floating on to the floor for your first dance as spouses. The sky-high glass roof allows natural light to flood the space during the day, and offers the opportunity to dance beneath the stars in the evening. Equally stellar banquet spaces are available for more intimate affairs. To perfectly pair with these sophisticated spaces, Blue Ridge Catering will tailor a menu that perfectly suits your event. Impress your guests and create singular memories when you kick off forever at the Taubman Museum of Art. Nestled against the Pacific between Zuma State Beach and Broad Beach, the Malibu West Beach Club offers a highly coveted setting for saying your “I do’s” at the waterfront! Defined by its sleek and chic spaces and majestic ocean views, this club has a decidedly exclusive feel that many other venues simply can’t achieve. Envision exchanging your vows on an expansive deck beneath a flower-laden archway, the endless expanse of the ocean reaching toward the horizon at your back as you share your first kiss as spouses. The one-of-a-kind views continue in the banquet room, which is tactfully perched on the top floor of the club. The space boasts effortlessly elegant features like sky-high vaulted ceiling adorned in rafters that are wrought with glittering lights and dripping with sparkling crystal chandeliers for that extra touch of class. Floor-to-ceiling windows face the ocean and open out to an adjoining deck, allowing you and your guests to bask in panoramic views of the world-renowned Malibu coastline. Despite its modern coastal feel, there is still something distinctly romantic about the beach club’s gorgeous spaces. Just like your marriage, the first-rate staff recognizes that your wedding day should be unique to you. You are sure to have a knockout occasion when you tie the knot at the Malibu West Beach Club! Standing in the heart of Old Pasadena, NOOR offers a modern yet dramatic backdrop to your big day. Each and every space is dripping with lavishness, creating a one-of-a-kind atmosphere that is sure to elevate any event. Imagine tying the knot in an extravagant circular outdoor courtyard, complete with a rustic trellis adorned with hanging plants and an elaborate fountain situated at the space’s hub. This sun-drenched space is sure to create a singularly romantic atmosphere as you exchange your vows. Spill into the Sofia Foyer, a stunning space reminiscent of the 1920’s thanks to its high ceilings and burnished wooden bar. After mingling with guests, sojourn into the magnificent Sofia Ballroom. This mesmerizing space is sure to impress thanks to its show stopping chandeliers imported from Prague, expansive windows, and customizable lighting. The adjoining Sofia Balcony allows you and your guests to enjoy drinks al fresco, all while taking in the sparkling city skyline and peaks of the San Gabriel Mountains beyond. The exquisite Ella Ballroom offers a similarly astonishing atmosphere thanks to its art deco styling contrasted with modern crystal chandeliers. Marrying the unapologetic luxury of the 1920’s with modern amenities and sophistication, it’s little wonder that couples are clamouring to kick off their forever at NOOR! Feb 6 Wedding Planning 101 — Should You Hire a Professional Planner?